Companies will take any opportunity to issue a press release. In the case of King’s Hawaiian Bread, the occasion is the turning of the seasons. Sounds like a good excuse as any. Especially because they included a couple of recipes in their press release. Ham, cheese, spinach, eggs, syrup, vanilla, cinnamon, and of course, bread. Yum. TORRANCE, Calif.–(BUSINESS WIRE)–Spring is here, which means it is the perfect weather to gather family and friends for a weekend brunch. To help hosts plan a delectable meal for their group, King’s Hawaiian, the family-owned company best known for its line of Original Recipe Hawaiian Sweet Bread, is sharing two of its most beloved recipes. While King’s Hawaiian bread and rolls are the perfect side to any meal, especially the Original Hawaiian Sweet Rolls during Easter dinner, they also can serve as a delicious ingredient in brunch dishes. The irresistibly soft, sweet Hawaiian bread, which is authentically crafted in the true spirit of the Islands, gives every meal a subtle touch of sweetness that guests will love. 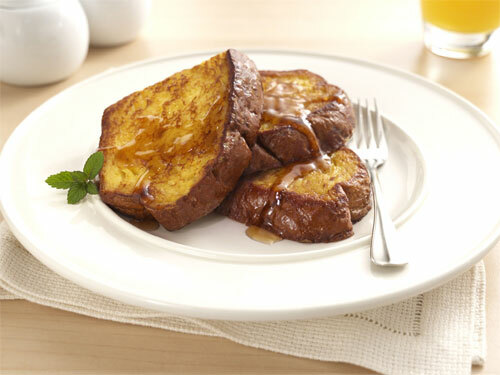 The King’s Hawaiian Original Recipe French Toast recipe is a favorite in many families. For a spring brunch, try topping it off with some fresh, seasonal berries that are available now. 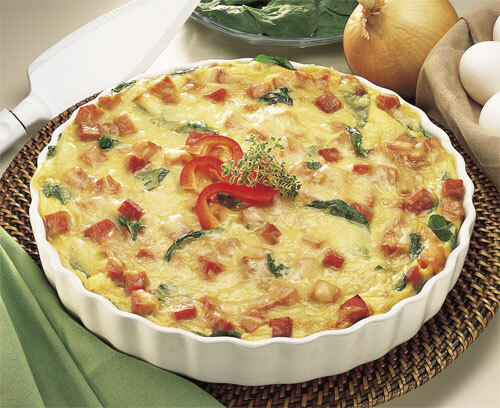 If a large group is expected, try the Ham and Swiss Florentine Bake recipe. The sweet and savory dish features fresh eggs, ham and spinach paired with the sweetness of King’s Hawaiian Bread. Both of these dishes will have guests vying for seconds. 1. Slice bread crosswise so that each slice is about 1-inch thick. Cut larger slices into halves or thirds, if desired. Set aside. 2. In a shallow mixing bowl, whisk together the eggs, milk, vanilla and cinnamon. 3. Quickly dip slices (do not soak) in egg mixture and cook until golden brown on both sides. 4. Keep egg mixture stirred and spices well blended. 5. Sprinkle with powdered sugar and serve with warm maple syrup. 1. Bake bread cubes on baking sheet with a lip in preheated 200° F oven for 30 minutes stirring once. 2. Meanwhile, heat oil in skillet, sauté onions on medium heat 15 minutes, add ham. Continue to cook until onions are well browned. 3. Whisk together eggs, milk and seasonings. 4. Place half of dried cubes into greased 9x13x2-inch pan. 5. Top with half of spinach, meat mixture, egg mixture then cheese. Repeat. 6. Cover with foil and refrigerate overnight. 7. Bake covered in a preheated 325° F oven for 55 minutes. 8. Remove foil and bake another 10-15 minutes, or until knife comes out clean when inserted in center. 9. Let sit 10 minutes before serving. Check out these and other family favorite recipes on the King’s Hawaiian Bakery website at kingshawaiian.com/recipes. Founded more than 60 years ago in Hilo, Hawaii by Robert Taira, King’s Hawaiian Bakery continues to be well known as a family-owned producer of irresistible, original recipe foods made with Aloha spirit. After introducing their delicious sweet bread to the mainland, the Taira family opened the popular King’s Hawaiian Restaurant & Bakery in Torrance, Calif. in 1988 and launched quick-service restaurant concept, The Local Place, in 2002. In addition to operating a dynamic 150,000 square-foot bakery facility, the company continues to expand its distribution of bread products into stores nationwide with an appreciation for quality ingredients and great taste. For more information, visit the company’s website at kingshawaiian.com, become a King’s Hawaiian fan on Facebook or follow King’s Hawaiian on Twitter.